designs chiropractic brochures that people read. More than a Chiropractic Brochure. More than a Marketing Piece. Our chiropractic brochures speak to today’s generation and represent the latest in chiropractic patient education. 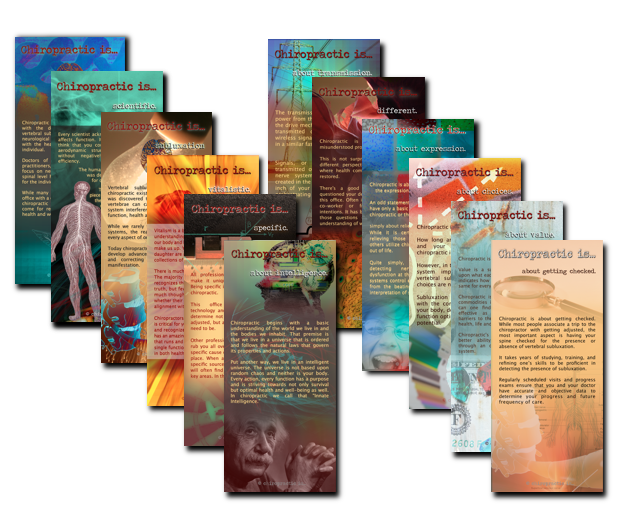 From the Millennial generation to the Baby Boomers, our brochures are beautifully designed, congruent with chiropractic philosophy, art and science and effective in communicating the key messages you want your patients to understand. They want it simple, they want it relevant and they want it in their communicative style and medium. chiropractic is… practice member education system brochures are printed on 3.6 x 8.5 inch card stock that not only stands out from the crowd, but also contain relevant, succinct and philosophically and scientifically accurate chiropractic information that will assist your practice members in making the logical choice to utilize chiropractic as a lifestyle choice and not merely a bandaid for symptom relief. 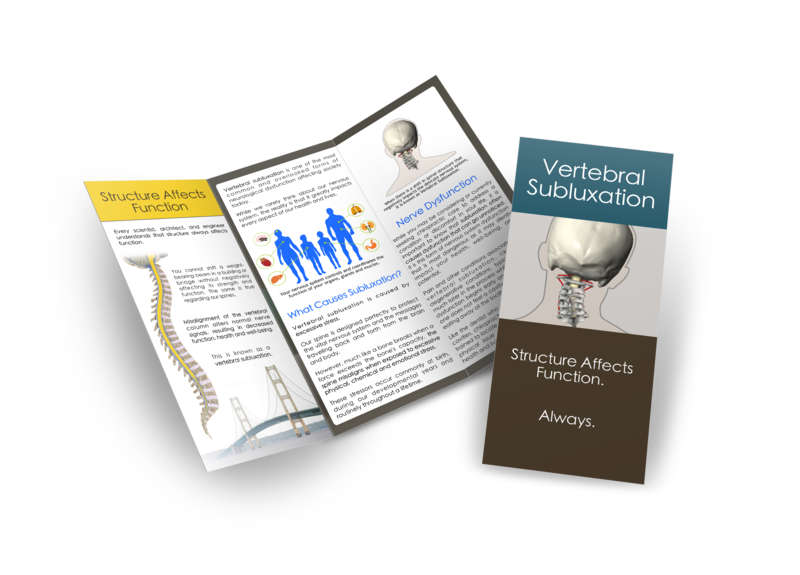 Our trifold vertebral subluxation chiropractic brochure is the most comprehensive, attractive and effective subluxation brochure on the market today. Designed to increase retention and referrals. FREE Implementation Manual to help you share the message and convert people to lifetime well-being care. Our chiropractic brochure education system revolves around the belief that once someone understands chiropractic, choosing to be checked for the presence of vertebral subluxation throughout a lifetime is the only logical choice. The only objections then become a distorted perception of cost vs value, ability to afford services, or values not congruent with what chiropractic is offering. From this perspective, the education is easy. The majority of the world already has a vitalistic, or at very least, a holistic worldview. The key is realigning them with that underlying belief and supporting them through that paradigm shift. Changing beliefs is not easy. However, at a very fundamental level, practice members have already accepted your premise and need only to be reminded and reconnected to it and the the things they value most. “These brochures couldn’t have been more tailored to my office if I had made them myself. It was the easiest materials conversion I have ever done. I started using them immediately, just as you described in your guide. These materials are a vehicle to re-establish a pattern of staying on focus that I have been struggling with. They reinforce the message, my message, simply and beautifully. I am having the kind of conversations happen in the office that I’ve always visualized. My order arrived just a couple of days after I placed it, surprisingly fast. These cards are thick and substantial, not floppy and weak. They take less than a minute to read, so each piece is bite sized for the typical person.